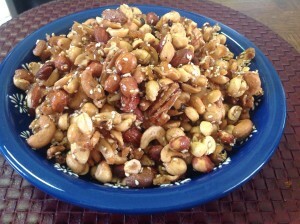 Between work and weekend travel, I was looking for nibbles that could be made in advance for our Easter “tea” party. I wanted things I could make in the evening after work that would still taste great a few days later. I found this recipe on MarthaStewart.com and thought I’d try it. Now, I can see that the danger is that if you make these gingered nuts in advance, you might be tempted to nibble before your party. You might be tempted to nibble a lot! One of the few changes I made was making my own candied ginger. I love the stuff, but it’s crazy expensive. It’s not difficult to make and will keep in a jar for months. One of the reasons I wanted to do some advance prep for this party, is that we spent the last 36 hours in Las Vegas. We joined Ed’s brother and our sister-in-law for the tail end of their vacation. I had some surprising observations about Las Vegas this trip. If we’re honest, it’s hard to spend time in Las Vegas without surprising observations. Here’s the story from this trip. I work in a church. I spend a lot of time there every week. I am probably more aware of Lent, Holy Week, and Easter than the average American. We stayed in a hotel off the strip, had one meal off the strip, one meal at Gordon Ramsey’s BurGR in Planet Hollywood, and one meal at the airport. It’s not like we didn’t leave our hotel, we weren’t just in the tourists areas. Just as the casinos make sure you have no sense of time, day or night, I felt like Las Vegas had no sense of the season. Good Friday, just another day. Even in our Tucson supermarkets, they’ve started writing “your Lenten headquarters” on the glass over the frozen fish. Not a commercialization I adore, but they acknowledged the season nonetheless. a few weeks later. . .
It’s taken me a while to finish up this post, but at least it’s still Eastertide. 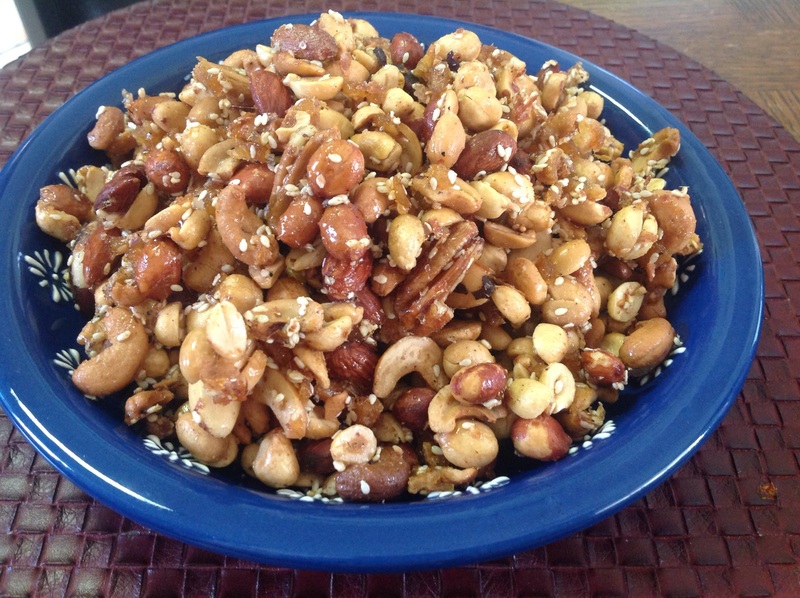 These gingered nuts are a tasty snack whatever the season. The ginger and sesame seeds are just enough to hint at an Asian flavor, something unique that really sets these apart. 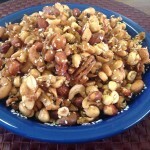 Do you have a favorite way to jazz up mixed nuts? Looks delicious and simple! I am copying this recipe to try some. I have to try making my own candied ginger too. Copying this recipe! Thank, Faithy! Let me know how they turn out. My favorite way to use the candied ginger is in scones! This recipe sounds delicious, sweet and salty, just how I like it! I also like your observations on Las Vegas. That place repulses me more and more, the older I get. It is a magnet for excess. I don’t get the appeal either, Julie. I go there to visit people not for the city itself. I loved those nuts. Definitely going to make this recipe.